This paper will try to show that the melting of the crust at the Mare Moscoviense site could have occurred as the result of impacts from a cluster of meteorites rather than from volcanism. 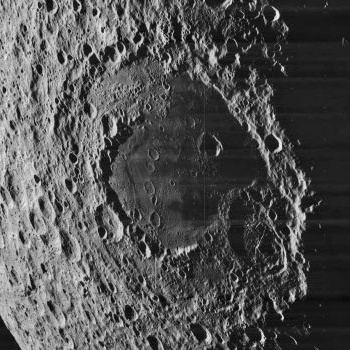 The Mare Moscoviense Basin is a circular area on the far side of the Moon with a diameter of 445 kilometers (Figure 1). 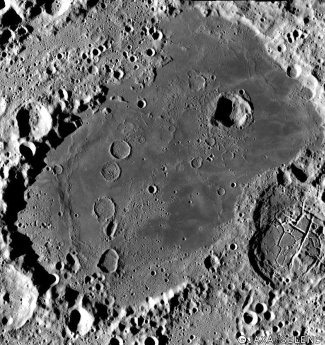 Mare Moscoviense is an area of smooth lava within the basin with an outline of three overlapping circles. The largest circle is approximately 160 kilometers in diameter, the second circle is 120 kilometers in diameter, and the smallest circle is 90 kilometers in diameter (Figure 2). Within the large circle of smooth lava, there are several impacts of about 15 kilometers in diameter, some of which overlap (Figure 3). The Moon is a small body that cooled rapidly. The emplacement of the mare fill took place after the lunar cataclysm in 3.9 Ga (3,900 million years ago) during which 80% of the Moon's crust was resurfaced by large impacts (Cohen et al., 2000). The majority of observed volcanic deposits were emplaced in the Late Imbrian Period, spanning from about 3.8 to 3.2 Ga, and surface volcanism on the Moon became infrequent and insignificant since about the late Archean on Earth (Head et al., 1997). The rocks collected from the Moon measured by radiometric dating range from about 3.16 Ga for the basaltic samples from the lunar maria, to about 4.5 Ga for rocks from the highlands (Papike et al., 1998). Studies using crater size-frequency distribution measurements have concluded that the period of active volcanism on the Moon lasted from approximately 4 Ga to 1.2 Ga, with Oceanus Procellarum having some of the youngest basalts on the lunar surface (Hiesinger et al. 2003). Samples from these younger basalts are not available to corroborate the age by radiometric dating. The scientists who examined the results of the Japanese Selene "KAGUYA" mission reported that the lava of the flat surface of Mare Moscoviense was deposited at approximately 2.6 Ga, based on cumulative crater size-frequency distribution dating, and was the result of volcanic activity that continued for at least 1.5 Ga following the formation of the Moscoviense basin (Morota, T., et al., 2009-a, 2009-b). Many studies categorically state that mare basalts originated from volcanic activity, but it is widely recognized that accretion played a major role in building the planets and the Moon (Zahnle, et al., 2007), so it is not unreasonable to postulate that at least some lunar maria and young basalts may be the result of impacts. Mare Moscoviense originated during the middle Eratosthenian, which was a time when the Moon was cool and had almost negligible volcanism. The following sections will explore the possibility that the more than 104 cubic kilometers of lava in Mare Moscoviense resulted from a meteorite cluster impact, rather than from an endogenic lava flow. Mare Moscoviense and detailed view of some impacts within it. Meteorite clusters are formed when comets consisting of rocks and dust held together in a matrix of frozen gases break up under gravitational forces after enough of the matrix melts or evaporates. The fragments of a comet may align in rows that follow almost identical orbital trajectories (Figure 4a). If the impact angle of a cluster is inclined relative to the impact surface, the objects create impacts that are separated from each other by great distances, as was seen when the fragments of comet Shoemaker Levy 9 impacted Jupiter in 1994. When the impact angle is more direct, the impacts may be close to each other and create crater chains, such as those of the Enki Catena crater chain on Ganymede. 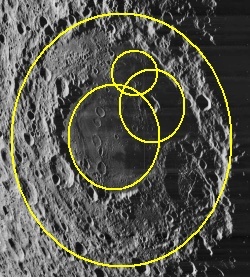 When the angle of the impacts is perpendicular to the surface, the impacts overlap, as shown by the overlapping circles of Mare Moscoviense. These types of impact patterns are illustrated in Figure 4b. Meteorite cluster impacts are generally difficult to identify. Meteorite clusters that create isolated impact patterns may look like individual impacts, and they may not be identified as a cluster of impacts unless the pattern along a line of flight is recognized. Meteorite cluster impacts that form adjacent patterns are easier to identify because their co-occurrence is more evident. Meteorite cluster impacts that create overlapping patterns are hard to recognize because the impacts fall on top of each other and obliterate evidence of the preceding strikes. In addition, once the crust has been melted by a previous impact, the subsequent impacts may fall on molten lava and produce lava splashes, craterless rims, and plastic deformations that are very different from the shattering shock metamorphism created by impacts on solid ground. The lava produced by overlapping meteorite cluster impacts may be easily confused with volcanic lava flows, and it is also possible that an energetic overlapping meteorite cluster impact may trigger a magmatic event on a planet with active volcanism. The craterless rim structures, such as seen in Mare Moscoviense (Figure 3), are usually interpreted by geologists and astronomers as cavities created by previous meteorite impacts that were subsequently filled by lava flows. Since the age of the lava was determined to be 2.6 Ga based on the density of impact cratering, it may seem reasonable to assume that an endogenic lava flow flooded the cavities of craters that had been made on a more ancient surface. One problem with this assumption is that there is no adequate explanation for why so many flooded craters, big and small, happen to be at the same topographic level as the surface of the mare and why no mountains stick out of the smooth portion of the supposedly flooded area. As will be explained below, craterless rims can also be created by impacts on a molten surface, but this mechanism of ring formation has not been considered previously. 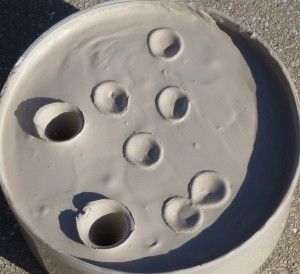 An experiment with clay that simulates the filling of previously existing craters by an endogenic lava flow is shown in Figure 5. The lava emerging to the surface has to create a lava dome which is high enough so that the lava can spread horizontally and fill the features at lower levels. The level of the lava must rise above the rims of the craters in order to fill the craters, and as the craters are filled, the path of the lava flows into the craters creates very specific features. Figure 6 shows a crater on Hesperia Planum photographed by ESA's Mars Express mission. The lower portion of this image shows a section of the rim where the flow of material into the crater is visible, and the interior of the crater has ripples that indicate a flow of the flooding material from the right side of the crater toward the left side. The filling material does not need to be lava, it can be a mud flow or other material that can be fluidized by an impact, tectonic activity, or erosive processes. Figure 6. 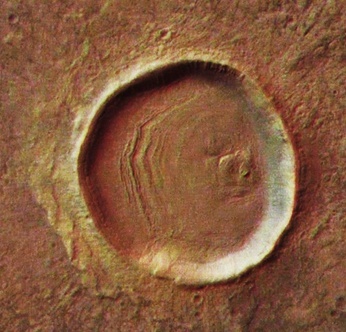 Crater on Hesperia Planum on Mars showing evidence of flooding. Impacts on viscous fluids, such as lava, produce craterless rims that look like flooded craters. 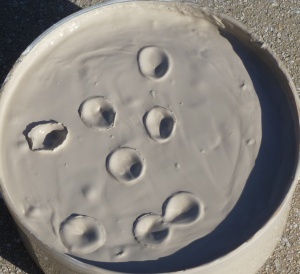 Figure 7a shows pictures of impacts on soft clay. 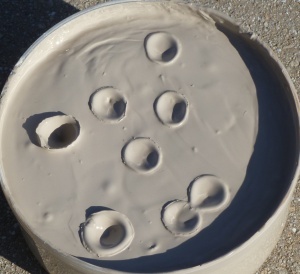 The experiment demonstrates that cavities made by impacts are filled by the viscous fluid but that the rims on the surface persist as evidence of the impacts. Since the impact cavities on a viscous surface are filled from underneath by the collapse of the cavity from lateral pressure, the morphology of the resulting ring structures is different from craters filled by overflow processes. Figure 7b shows two craters from Mare Moscoviense which have been described as "flooded craters" (Morota et al., 2009-b). However, careful inspection indicates that the rims have not been overflowed by lava, and the central parts of the rings show concentric marks indicating that the craters were filled from underneath by viscous relaxation. Figure 7a. Impacts on soft clay. The ring structures of previous impacts remain stable even as the cavities of new impacts are filled. Figure 7b. 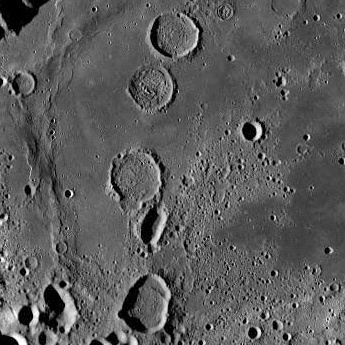 Craterless rims from Mare Moscoviense. The craterless rim structures on Mare Moscoviense have been usually interpreted as impact craters that were subsequently filled by lava flows, rather than as impacts that occurred on a molten surface where the formation of a crater would not be possible. An impact on a molten surface creates a rim that protrudes above the molten lava, and because of its large surface area, the rim radiates heat faster and is able to cool and solidify before the pool of lava. The cavity made by the impact is quickly filled by molten lava and only the rim remains above the level of the pool. 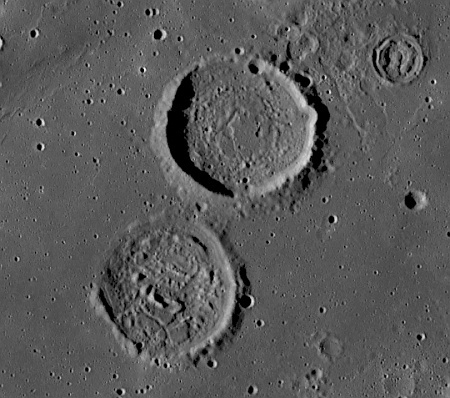 Mare Moscoviense provides examples of a range of impacts from almost rimless circles (ghost craters) to circles with well-delineated rims, which would depend on the temperature and viscosity of the lava at the time of impact. For impacts on a molten surface, the filling of the cavity starts almost immediately as concentric lateral pressure pushes lava into the cavity. The deepest part of the cavity, where the lateral pressure is greatest, fills first, and the filling continues from the bottom toward the surface. The progression of this mechanism can be seen in the leftmost two impacts of Figure 7a. The concentric marks in the center of the Mare Moscoviense craters in Figure 7b provide evidence that the impact cavities were filled by concentric lateral lava flow as would be expected for impacts on a molten surface. 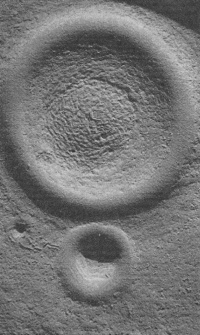 This interpretation is supported by Figure 7c which shows the concentric marks that form when an experimental crater of hemispherical shape produced in asphalt relaxes into a flat surface (Scott, 1967). The concentric wrinkling occurs because the surface layer of a hemispherical crater with an area of 2πr2 is not perfectly elastic, and it is deformed to fit into a planar surface with an area of πr2 by viscous relaxation of the substratum. For craters on molten lava, the leveling process slows down as the lava becomes more viscous and finally stops when the lava cools completely and solidifies. Multiple impacts on a molten surface provide evidence of a meteorite cluster, particularly if some of the impacts overlap and show signs of plastic deformation from adjacent impacts. The first impacts of a meteorite cluster fall on a solid surface producing craters, shock metamorphic effects, and melt and vaporize a large volume of target rock together with virtually all of the impactor (French and Koeberl, 2010). Additional impacts in the same area fall on the molten surface and create features that are more typical of impacts on viscous fluids. The analysis of geologic evidence from overlapping impacts of a dense meteorite cluster has to take into consideration that the initial impacts may be obliterated by the following impacts and only the largest impacts and the smaller impacts that follow remain as evidence. Meteorite impacts that occurred after the surface of Mare Moscoviense solidified, such as the large Titov crater in Figure 7d, have deep hemispherical craters that are associated with shock metamorphism. In addition to the morphological characteristics discussed above, it should be possible to distinguish between flooded impact craters and the rims created by impacts on a molten surface on the basis of their geological origin. The rim zone of a flooded impact crater must be consistent with an impact on a solid surface. The rims of flooded impact craters must be formed from materials similar to the lunar highlands such as anorthosites, norites, and tractolites with evidence of brecciation and shock metamorphism. However, the fill material must be basalt of volcanic origin. Thus, lunar flooded craters must have rims of older lunar crust with a center filled by newer basalt. By contrast, the rims of impacts on a molten surface should have identical composition to the fill material, where both the rim and the fill are of the same age with no evidence of shock metamorphism. Radiometric dating or spectral analysis of the rims and their centers may be able to distinguish between flooded craters with rims older than their centers, and rims created by impacts on a molten surface where the rim and the center are of the same age. 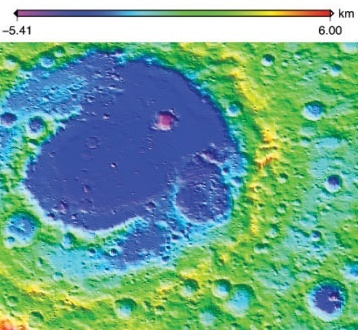 Mare Moscoviense does not show evidence of a lava dome or cone as a source of an endogenic lava flow as is usually the case for an endogenic lava structure, illustrated in Figure 8a. 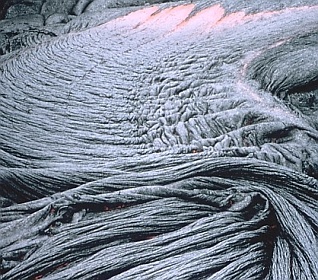 A typical basaltic Pahoehoe (smooth) lava flow with an approximate temperature of 1100 to 1200°C is illustrated in Figure 8b. It may be argued that Lunar mare basalts tend to be very low viscosity, and, in most cases, not explosive, so volcanic constructs at the eruption center can be so subtle as to be missed entirely, but it is unlikely that a volcanic process that produced more than 104 cubic kilometers of lava, flowed an average of 125 kilometers from the source, and covered an area of 40,000 square kilometers would not have left evidence of the point from which the lava originated. A lava flow spreading radially at a fast speed of 30 kilometers per hour would require over four hours to travel from the center to the edge of the mare to cover an area four times the size of the island of Hawaii, and in this time, it is inevitable that some of the lava would cool and create structures typical of volcanism, particularly after encountering obstacles like hills and craters in the original landscape. The hypothesis of the endogenic origin of Mare Moscoviense would require some evidence of volcanic features such as volcanic domes and typical volcanic lava flows, but these features are not present. In addition, the craterless rims of Mare Moscoviense have a greater similarity to impacts on a molten crust than to craters filled by volcanic lava because the crater rims have not been breached by external lava flow, and the interiors of the craterless rims do not show the paths of any lava flows into the craters. Endogenic lava must have a point of origin, like a fissure in the ground, from which the lava flows. Endogenic lava must rise to a level where the force of gravity provides enough pressure for the lava to spread along the surface. This process generally creates a lava dome since the lava can only flow downhill to lower elevations. Lava has temperature differences between the source and the destination which usually leads to accumulation and cone building around the source of the lava. To justify a volcanic lava flow, the moon or planet has to have a molten core and enough internal pressure to force the lava to the surface. This pressure is usually provided by tectonic activity. The lava is generated in a large area within a short time. The lava is confined to the area of impact. The lava created by an impact does not create lava domes. Impact lava tends to form circular pools within the craters. In order to provide a plausible alternative to the volcanic origin of the lava in Mare Moscoviense, it is necessary to calculate the energy required to melt the crust of the Mare and then determine if the impacts of a meteorite cluster could have provided sufficient energy to create all that lava. Figure 9. Mare Moscoviense area. The area of smooth lava in Mare Moscoviense is approximately 160 kilometers by 250 kilometers which is an area of 40,000 square kilometers (Figure 9). The greatest thickness of the Mare basalts has been estimated to be 600 meters by Morota, et al. (2009-b), but for this calculation we are going to assume that the lava was five times thicker with a depth of 3 kilometers, and thus Mare Moscoviense had a volume of 120,000 cubic kilometers of molten crust. The energy calculation has to take into consideration that the Moon's surface temperature rises above 100°C at lunar noon and drops to -155°C at night, and also that all igneous rocks melt and form magma at about 1200°C. The size of the meteorites in the cluster and the energy produced by the impacts can be calculated using the University of Arizona's online calculator to estimate the projectile size from crater diameter (Melosh and Beyer, 1999). The program uses the Pi Scaling method to estimate the diameter of the projectile and calculate its kinetic energy (1/2mv2). The calculations show that the initial impact that created the basin had more than enough energy to raise the temperature of the crust to 1200°C and melt the volume of lava in Mare Moscoviense. The additional energy of the three large impacts (1.4 × 1023 Joules) falling in the same area would have been able to raise the temperature to more than 1400°C to produce a non-volcanic basaltic melt that resulted in the smooth surface of the Mare. Such a high temperature would not have been achieved if the impacts that formed the Mare Moscoviense had fallen on a cold surface. The fact that a very high temperature was achieved to form the fluid Mare lava is an indication that the impact that formed the 445-km basin had to immediately precede the impacts that formed the overlapping circles with diameters of 160, 120 and 90 kilometers. The final small impacts that fell on the molten surface produced the craterless rims that may be considered the tell-tale signs of a meteorite cluster impact. 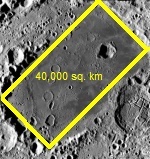 Figure 11 is an image of Mare Moscoviense area obtained by the Lunar Orbiter Laser Altimeter (LOLA) on NASA’s Lunar Reconnaissance Orbiter (LRO) mission, launched on June 18th, 2009. The rim of the Mare Moscoviense basin that rises above the surrounding area is highlighted in yellow. The image distinctly shows the circular interior of the basin and the overlapping circular areas of the Mare at approximately the same topographic level. Figure 12. Possible order of meteorites, and their diameters in kilometers. A possible order in which the meteorites impacted (from left to right) is illustrated in Figure 12. Two question marks have been placed ahead of the 10.9 km meteorite that created the basin because the evidence of any smaller impacts that preceded would have been obliterated by the larger impact. The impact of the 10.9 km meteorite created the 445-km basin and a large pool of lava. This 10.9 km meteorite was followed by meteorites with diameters of 1.72 and 1.26 km that produced the overlapping Komarov craters. This sequence can explain the cracked appearance of Komarov (Figure 13). If the impacts that created the Komarov crater happened before the formation of the Mare, the surface lava of Komarov could have had enough time to cool to form a solid crust. The crust would have cracked by the surge of internal pressure when the impacts of the meteorites with diameters of 3.6, 2.63, and 1.93 km created the Mare. The cracking of the Komarov lava would be more difficult to explain if the order of the impacts that created Komarov and the Mare were reversed. The meteorite with a diameter of 3.6 km hit directly in the center of the Basin which was the area that contained the hottest lava from the basin formation; the additional energy from the impact increased the temperature further and made the lava more fluid thereby producing a very smooth surface. A few small meteorites fell on the molten smooth surface creating the craterless rims in Figure 3. The distance between the meteorites in the cluster would have determined how much time the lava had to cool before the next impact occurred. In the case of the fragments of comet Shoemaker-Levy 9 that impacted Jupiter, the time intervals between the more than 20 major impacts was from two to five hours, and the impacts took place over a period of about five days (Yeomans and Chodas, 1994). Those intervals may serve as a guide to interpret what occurred on the Moon. A viable hypothesis for the impact origin of Mare Moscoviense requires identifying the conditions under which the overlapping impacts of the cometary fragments could have occurred. If we take into consideration that there were six major impacts, and that the likely time interval between each of those impacts was two hours, as was the case for the Jovian impacts by Shoemaker-Levy 9, then we need to find trajectories such that the Moon would be relatively stationary for at least 12 hours with respect to the trajectory of the cometary fragments. In addition, the position of the impactors and the Moon must be such that the impacts can occur in the eastern hemisphere of the Moon at Lunar latitude 27.3°N and longitude 148.1°E, which is the location of Mare Moscoviense. These are some of the facts that can be used to solve this problem. Many comets have elongated elliptical orbits that may take them from the proximity of the Sun to beyond the orbit of Jupiter. The Moon has a semimajor axis of 384,400 kilometers, a revolution period of 27.3 days, and a mean orbital velocity of 1.023 km/sec (Williams, 2010). The Moon covers an arc of 13.2° in its orbital path in one day, and since the Moon is tidally locked with the Earth, the rotation of the Moon about its axis is also 13.2° per day. Since the elliptical orbits of comets are extremely elongated, the cometary trajectories intersecting the Earth-Moon system are fairly straight lines radiating from the general vicinity of the Sun. If one of the cometary fragments were to impact the Moon when the orbit of the Moon is orthogonal to the trajectory of the cometary fragments (new Moon phase), a second fragment arriving two hours later could not hit the Moon because the Moon would have already traveled 7,365 kilometers away from the intersection of the trajectories, and the Moon, with a diameter of 3474 kilometers, would avoid a second impact. The situation is different when the cometary trajectories are tangential to the Lunar orbit and intersect during the first quarter phase or the third quarter phase of the Moon (See Figure 14). Under these circumstances, the sagitta (the perpendicular distance from an arc's midpoint to the chord across it) corresponding to the chord subtended by an angle of 13.2° at the distance of the Moon's orbit is 2548 kilometers. This means that during the first quarter phase and the third quarter phase, the Moon is vulnerable to multiple impacts from cometary fragments for 24 hours because the orthogonal movement of the Moon relative to the cometary trajectory is less than the diameter of the Moon. The sagitta for a 12 hour period when the Moon travels over an arc of 6.6° is 637 kilometers which makes overlapping cometary impacts more likely, particularly because tidal locking would expose the same area of the Moon's surface to the series of impacts. Figure 14 shows two scenarios for an impact at the coordinates of Mare Moscoviense. The first one is from cometary fragments traveling away from the Sun during the first quarter phase of the Moon, and the second one is from cometary fragments on their way to the Sun which would strike the Moon during its third quarter phase. Figure 15 illustrates how cometary fragments following a tangential collision trajectory might have approached to impact the far side of the Moon's eastern hemisphere during the first quarter phase as viewed from Earth. about to hit the eastern hemisphere of the Moon to form Mare Moscoviense. 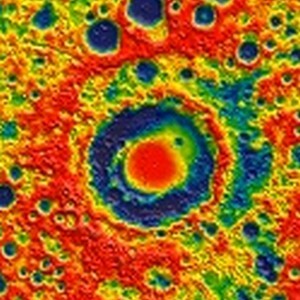 NASA's Gravity Recovery and Interior Laboratory (GRAIL) mission from March to May 2012 produced very accurate gravity maps of the Moon. Melosh et al. (2013) analyzed the anomalous gravitational areas of the lunar maria (mascons) and were able to determine by the use of hydrocode simulations that the bull's-eye concentric patterns are a natural consequence of crater excavation, collapse and cooling following an impact. Figure 16 shows the gravity map of Mare Moscoviense with a very clear concentric pattern of gravitational anomalies that provides support for the impact origin of Mare Moscoviense. This paper proposes that the multiple craterless rims found on Mare Moscoviense are impacts on a molten surface and not flooded craters. The occurrence of multiple impacts which are contemporaneous with the formation of Mare Moscoviense lead to the conclusion that Mare Moscoviense was formed by the impacts of a meteorite cluster. The calculation of the energy provided by the impacts that created the Mare Moscoviense Basin and the three large overlapping circles substantiate that the lava of Mare Moscoviense could have originated from the impacts of a meteorite cluster. The assessment of the trajectories required for overlapping impacts by cometary fragments identifies the conditions under which such impacts would be possible. The absence of global tectonic activity on the Moon 2.6 Ga ago, and the absence of volcanic structures in the Mare Moscoviense area makes it more plausible that the lava of Mare Moscoviense originated from a meteorite cluster impact than from volcanic activity. The gravitational map from the 2012 GRAIL mission supports the impact hypothesis. This paper proposes that flooded craters may be differentiated from the craterless rims made by impacts on a molten surface by dating the rim and the center of the crater. Cohen, B.A. ; T. D. Swindle; D. A. Kring, 2000, Support for the Lunar Cataclysm Hypothesis from Lunar Meteorite Impact Melt Ages. Science, v. 290, no. 5497, 1 p. 1754-1755. French, B.M. ; Koeberl, C., 2010, "The convincing identification of terrestrial meteorite impact structures: What works, what doesn't, and why" Earth-Science Reviews, 98 (2010) 123–170. Head, J. W., et al., 1997, Lunar mare basalt volcanism: Early stages of secondary crustal formation and implications for petrogenetic evolution and magma emplacement processes, Conference Paper, 28th Annual Lunar and Planetary Science Conference, 1997, p. 545. Morota, T., et al., 2009-a, Mare volcanism in the lunar farside Moscoviense region: Implication for lateral variation in magma production of the Moon, Geophys. Res. Lett., 36, L21202, doi:10.1029/2009GL040472. Papike, J.; Grahm Ryder; Charles Shearer (1998). "Lunar Samples". Reviews in Mineralogy and Geochemistry, 36: 5.1–5.234.